Last night everyone was looking towards the Ducks-Blackhawks game because of their previous meeting where a couple of fights broke out. I thought the same would happen and I was semi-right with one good bout and a crap fight. First Brad May and Danny Richmond dropped the gloves off a faceoff and tried to fight but they both went down to the ice quickly. Not many punches thrown but it looked like May threw some. I have heard that his doctor told him not to fight because his shoulder couldn't take it, but last night it didn't look that way. Later in the game, George Parros and David Koci had a rematch and it was pretty good with Koci getting the edge. He looked to land some big punches and Parros also got some in there. Watch the YouTube video of the fight below. Also last night in the Hurricanes-Flyers game, Mike Commodore and Ben Eager dropped the gloves near the end of the second period but it wasn't much of a fight as both guys looked tired and only threw a few punches each. I give this one a draw. Well hockey fight fans were looking for the Georges Laraque vs Donald Brashear matchup on Tuesday night and we got it. The heavyweight title was on the line but the fight wasn't much as both guys got in some quick punches at the start but they went down quick. I give this fight a draw. View the YouTube video of the fight below. Also on Tuesday, in the Blue Jackets-Blues game, Jody Shelley and rookie D.J. King had an ok fight with King getting in a lot of jersey jabs and throwing most of the punches. Anyone else think Shelley has had an ok to bad year in fighting this year? He hasn't done as well as previous years. In the Oilers-Predators game there were two fights and Oilers veteran defenseman Jason Smith was in both of them. First Smith fought Ramzi Abid in a spirited bout with not many punches landing but both guys looked heated. Later in the game, Darcy Hordichuk layed out Smid with a hit and Smith came right in and they dropped the gloves. Both guys threw some punches and Hordichuk got the takedown at the end. Hordichuk's tiedown ripped and his jersey came off and for some reason the referees thought he wasn't tied down so they threw him out of the game. The television replays showed the tiedown so the referees messed up on that call. Maybe they threw him out because he's a tough guy? Early week roundup, Red Wings get a fight! This past Saturday was a slow night. Usually Saturdays bring a lot of rough stuff but not this time. There were only two fights. In the Thrashers-Penguins game, Keith Tkachuk and Maxime Talbot dropped the gloves but Talbot had no chance in this one as Tkachuk threw all the punches (none landed though). Decision to Tkachuk. The other fight of the night was a heavyweight bout between Derek Boogaard and Raitis Ivanans. It wasn't the slugfest that we all hoped for, but Ivanans showed he can hang in there with the "Boogieman." It looked like both guys didn't land any punches but they both threw quite a few. By the way I really hate those Minnesota Wild homer broadcasters. I know most if not all television broadcasters are homers but the Wild broadcasters are way over being homers and just plain old annoying at times. View the Boogaard-Ivanans fight below. On Sunday there was only one fight, with Ian Laperriere and Jeff Cowan having a good bout. Laperriere won the start of the fight but Cowan came back at the end to give this one a draw. On Monday the Detroit Red Wings actually had a fighting major. Andreas Lilja dropped the gloves with Travis Moen. He probably should have thought that one through as Moen threw most of the punches in their fight. Lilja did though look to land the first punch of the fight, but after that it was all Moen. Decision to Moen. On Thursday there were three fights. In the Sharks-Thrashers game Mark Bell and Jon Sim had a fight where Bell sent Sim down to the ice with a punch. No question decision goes to Bell. In the Senators-Panthers game Chris Neil and Steve Montador dropped the gloves and Montador landed a good left but Neil came back with some of his own punches. I would give this one a draw, maybe an edge to Montador. In the Blues-Wild game, heavyweights D.J. King and Derek Boogaard had a good fight with Boogaard getting the decision but King hung in there all he could. On Friday there were two fights in the Kings-Blackhawks game. First Tom Kostopoulos and Danny Richmond had a fight where it was all Richmond. Then there was a heavyweight fight with Raitis Ivanans and David Koci going at it. I would give their fight a draw. Watch it below. Besides the KO heard around the hockey fighting world, which I posted about last night after it happened, there were two others fights on Wednesday night. In the same Flyers-Rangers game as the Orr KO on Fedoruk, Orr took on Ben Eager in the first period as well. Orr didn't KO Eager, but it was Orr early and Eager late in the fight. I give that one a draw. You can view that fight below. So is the Flyers-Rangers rivalry heating back up in this new NHL? I believe they play again later before the season ends. Maybe the Flyers will bring up Riley Cote to take Fedoruk's spot if Fedoruk is unable to play again this season. Their next meeting should be interesting. In the Capitals-Sabres game, the two heavyweights had a rematch from their earlier fight this year where Peters nailed Brashear with some nice shots. But in this one it was all Brashear as he looked to overpower Peters, pulling him off balance and throwing punches as Peters tried to get loose. Decision to Brashear in this one. Wow I was watching the Flyers-Rangers game tonight and Todd Fedoruk and Colton Orr dropped the gloves and Orr knocked Fedoruk the **** out! What a right handed punch by Orr. It sent Fedoruk down to the ice and he looked to be knocked out. It took a second before Fedoruk looked to move. They took Fedoruk off on a stretcher but he seemed like he wanted to get up and go to the penalty box. Adam's Hockey Site already has this clip up and you can download it on their fight clips page, and you can even watch a YouTube video of it below. Sweet! Fedoruk suffers yet another time being knocked down by a punch. Should he retire so he retains his health? I hope he is ok because I like him and he is tough but when you take two shots like he took this season (against Boogaard and now Orr), he should think about his life outside of hockey. On Sunday there were just two fights. In the Lightning-Capitals game, Shane O'Brien and Matt Bradley fought in a spirited bout with O'Brien early and Bradley coming back at the end. I gave that one a draw. In the Coyotes-Stars game, Daniel Carcillo and Krys Barch dropped the gloves and had a round and round we go type of fight. They kept spinning throwing rights when possible. Then they got in tight and exchanged some more punches. It was a long fight that Carcillo looked to hurt his hand and didn't want anymore. They both tired out and the fight was over. Barch skated away with a cut above his left eye with blood dripping down the side of his face. I gave the edge to Barch, but I think you could call it a draw. Good fight nonetheless. On Tuesday there were three fights, all coming in different games. In the Devils-Maple Leafs game everyone knew Cam Janssen would have to fight somebody because of his hit on Tomas Kaberle in an earlier game. Wade Belak was the one to call out Janssen and they had a long spirited bout with Belak looking to get the edge in that one. In the Blue Jackets-Blackhawks game, Danny Richmond and Manny Malhotra had a hugfest with no punches really being thrown. I was surprised they got fighting majors. In the Panthers-Flyers game, Gregory Campbell instigated a fight with Ben Eager. He shouldn't have done that because Eager gave it to him pretty good. Win to Eager in that one. The big talk right now is about Nashville Predators' energy player Jordin Tootoo and his punch that knocked out Stephane Robidas of the Dallas Stars on Saturday night. On Monday Tootoo was suspended for 5 games for his punch. Here's what happened: Tootoo layed out Mike Modano which looked to be a hard clean check. It was clean, maybe could have been charging, but this is still hockey, players can hit each other. We all know Bettman wants ballerina dancing in hockey, but Tootoo says "NO!" and so do we fans of true hockey. Anyways, Tootoo lays out Modano with a clean check, Robidas looks to be coming in on Tootoo high with his arms, but before Robidas can get at Tootoo, Tootoo turned and fired a gloved right hand punch that sent Robidas down to the ice and down for the count as he was out. Watch the YouTube video of this incident below. Make sure you catch Mike Modano's reaction to his teammate getting knocked out after he came in to protect Modano. Modano slashed at Tootoo's back, and then just stood there, backing away from Tootoo not wanting any piece of him. What a good teammate Modano is, he just had a teammate try and stand up for him and he did nothing to help Robidas. Geez, no wonder he lost the Captaincy in Dallas. Even Marty Turco and Trevor Daley came in to try and get at Tootoo but the linesmen made sure to break everything up before it got out of hand. I think five games is too much, maybe two or three games is enough. What do you think? I think Robidas got what he deserved and Tootoo was protecting himself from getting knocked out himself. All Tootoo knows is that someone is going after him, so he better defend himself. Robidas should have blocked his face with his gloves because what a shot Tootoo gave him. Even Mark Messier on VS didn't think Tootoo should have been suspended. That's right Mark, you're right on, old-time hockey baby, let them play! This past Saturday again proved once again that Saturdays are fight night in hockey. In the Bruins-Rangers game there were three fights, with Jeremy Reich dropping the gloves twice. First there was Reich vs David Liffiton with maybe Liffiton getting the edge in that one. Later Chuck Kobasew and Ryan Callahan had a wrestling match which was a draw. Reich's second fight in the game was against Ryan Hollweg which was a good one. Both guys looked to land a few, but Reich got the better of Hollweg and I give the edge to Reich in that fight. View a nice picture below of their fight. In the Hurricanes-Devils game, Craig Adams and Johnny Oduya had a spirited bout right off a center ice faceoff. Both guys exchanged punches and I give the edge to Adams, but I think it could be called a draw. In the Avalanche-Coyotes game, Mark Rycroft and Daniel Carcillo dropped the gloves in a spirited bout where Carcillo looked to land the only punches. Decision to Carcillo, who has played well since being called up by Gretzky and Co. In the Blue Jackets-Kings game, Dustin Brown layed out Klesla with a big hit and Alexander Svitov instigated a fight with him. I would give that one a draw, but Brown did have red marks on his face after the fight. In the Blues-Oilers game, Matt Walker and Jean-Francois Jacques dropped the gloves and had an ok fight where not much looked to land but they exchanged punches. I would give that one a draw, maybe edge to Walker. In the Maple Leafs-Canadiens game Darcy Tucker and Francis Bouillon had a rematch where Bouillon had the edge early because he had his shield/helmet on. Decision/edge goes to Bouillon. He's really brave fighting with the shield on. A piece of Canadiens fairy trash. He's right there with fairy dive artists Mike Ribeiro and Andrei Markov. If you remember, earlier this season, Bouillon knocked down Tucker with one punch when Tucker wasn't ready and still had his gloves on. You can view that fight and their fight from Saturday night below. Friday night was a wild night for the Blackhawks and Ducks that is. They brought back some old-time hockey with four hockey fights in the game. The first fight was between heavyweights David Koci and George Parros. They both exchange right hands and grapple and then go down to the ice together. I give that one a draw as neither guy looked to land a solid punch. Later in the game Tuomo Ruutu looked to high-stick Andy McDonald, so Chris Kunitz dropped his gloves, grabbed Ruutu and started throwing punches at him. Ruutu turtled as Kunitz threw punches and didn't really hurt Ruutu at all. Later, Ryan Getzlaf and Danny Richmond dropped the gloves but it was all Getzlaf as Richmond waited to throw a punch and then he lost his balance and went down. Decision to Getzlaf in that fight. Then later in the game, something that hasn't happened in a while happened. On the faceoff, before the puck was dropped, David Koci and Sean O'Donnell had some words and gave each other pushes and sticks, and they dropped the gloves and threw punches furiously at each other. Koci with the better punches but O'Donnell got some in too, and Koci got the takedown as well. Decision to Koci in that fight. You can watch that fight below. In the Rangers-Thrashers game, Colton Orr and Eric Boulton had a rematch from their first fight earlier this season with Orr knocking down Boulton with a punch. This time it was a closer fight with Orr having the edge early on and then Boulton came back with some punches. But I give the decision to Orr in that fight. In the Sabres-Lightning game, Andrew Peters and Andre Roy dropped the gloves. It was mostly Peters in this fight as it looked like Roy went down from a Peters punch. On Monday there were three fights, two of them in the Oilers-Kings game. In the Oilers-Kings game, Brad Winchester and Scott Thornton went at it. It started because Winchester layed out a Kings' player and then Thornton came right over and went at Winchester. Later in the game, in the third period Brad Winchester went after Raitis Ivanans because of a hit and the fight was mostly a wrestling match with no winner. In the Blues-Flames game, Jamal Mayers and Rhett Warrener went at it with Mayers looking to get the only good punch in during the fight. I gave the edge to Mayers in that fight. On Tuesday there was only one fight and it was Stars' Krys Barch pounding on Flyers' Denis Gauthier after Gauthier went low on a Stars' player. Barch threw all the punches on a turtling Gauthier, decision to Barch. On Wednesday we had another one fight night, with old-timer Gary Roberts of the Penguins going with Devils' Mike Rupp in a fight near the Devils' bench. This one was mostly a wrestling match with Roberts looking to throw Rupp over into the Devils' bench. The old-timer still has it. On Thursday there were only two fights. In the Capitals-Bruins game Matt Bradley and Andrew Alberts dropped the gloves. It was mostly Bradley in this fight as Alberts looked to have balance issues. In the Blackhawks-Kings game, Cam Barker and Jamie Lundmark dropped the gloves and had a spirited bout. Lundmark looked to land a few nice punches, and I would give the edge to Lundmark in that fight. On Sunday there were six fights, and three of those were in one game. First, in the Bruins-Red Wings game Jeremy Reich and Darryl Bootland had a spirited bout with Reich getting the decision. In the Kings-Stars game, there were two fights. The first one was a short one with Jeff Halpern instigating a fight with Dustin Brown after Brown hit Mike Modano. No winner here as it wasn't much of a fight. Later Tom Kostopoulos and Krys Barch had a fight where it was mostly all Barch throwing punches. Decision to Barch. In the Canucks-Ducks game there were three fights, all in the first period. First Kevin Bieksa instigated a fight with Dustin Penner after Penner hit a Canucks player hard into the boards. It was all Bieksa as Penner lost his balance and Bieksa got in some good punches on Penner. Decision to Bieksa. Later Jeff Cowan and Shawn Thornton dropped the gloves and Cowan looked off balance and it was all Thornton in that fight. Decision to Thornton. Later in the first period Jeff Cowan and Joe DiPenta dropped the gloves and it was all Cowan as he right at DiPenta with lefts and DiPenta fell backwards to give the decision to Cowan. Chicago Blackhawks' David Koci made his NHL season debut last night and made a bang. He reminded the old-time hockey fans what hockey once was, a tough hard-working, hard-hitting sport. Koci racked up 42 penalty minutes in his first game which included three fights and a huge clean hit which he got thrown out of the game for. Koci got into two good fights with Phoenix Coyotes' tough guy Josh Gratton. In their first fight Gratton sent Koci down with two big rights. In round 2 they had a slugfest with both guys landing some nice shots. You can watch both fights below. You can download both fights on Adam's Hockey Site fight clips page. In that same Blackhawks-Coyotes game, Danny Richmond and Daniel Carcillo dropped the gloves and had a spirited bout with Carcillo gettting the edge. In the third period David Koci layed out Bill Thomas with a clean check and Nick Boynton went after Koci. They had an uneventful fight with Boynton getting the takedown. I would give that one a draw, maybe Koci an edge. There were other fights on Saturday. In the Bruins-Flyers game Jeremy Reich and Darren Reid had a fight with Reich getting the edge. 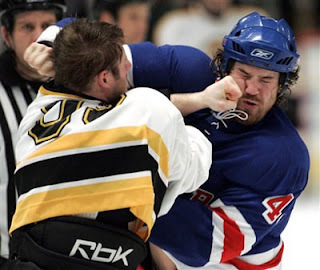 In the Rangers-Penguins game, the heavyweight title was on the line as Colton Orr and Georges Laraque had a fight that Laraque dominated. Laraque looked to land two big lefts that sent Orr down to the ice. Win to Laraque and he retains the title. I believe this was Laraque's first fight in three months! That's too long. In the Devils-Sabres game, Cam Janssen was playing in his first game back from his suspension and it didn't take long before he found a dance partner. Janssen dropped the gloves with Sabres' enforcer Andrew Peters. They had a long fight with not many punches landing as they held each other away from each other. I would give a slight edge to Peters in this fight. I didn't have time to post about Thursday and Friday's fights until now so here we go. Thursday night there were four hockey fights. Panthers' Alexei Semenov and Flyers' Todd Fedoruk had a wrestling match where both guys didn't throw many punches and Semenov somehow fell down to the ice. I give that one a draw. In the Canadiens-Thrashers game, Francis Bouillon put a dirty knee-on-knee hit on Marian Hossa and Keith Tkachuk went after him. They both exchanged some good punches but Tkachuk got in the last punch that sent Bouillon down to the ice. Tkachuk gets the TKO win there. Watch the YouTube video of this fight below. In the Flames-Predators game, Robyn Regehr and Jordin Tootoo had a battle where both guys threw punches and Regehr went down from losing his balance I think. I would maybe give a slight edge to Tootoo in this one, or a draw. In the Stars-Blues game, Barrett Jackman kept following Eric Lindros around the ice challenging him to fight and finally Lindros came back with a cross-check and then they dropped the gloves and had a wrestling match with not many punches thrown at all. I give this one a draw. On Friday there were three fights. First there was Hurricanes' Tim Gleason and Capitals' Ben Clymer going at it in a short fight where not many punches were thrown. Clymer bumped into the Hurricanes' goalie which caused this fight. Draw in this one because no one landed anything, Gleason did throw two punches but both missed. In the Wild-Sabres game, Stephane Veilleux and Patrick Kaleta grab a hold of each other and drop the gloves in front of the Sabres bench after a scrum. Veilleux throws lefts and Veilleux throws rights. Veilleux eventually wrestles Kaleta down to the ice. I give this one a draw. In the Oilers-Ducks game Zack Stortini and George Parros had some talking early in the game but Stortini declined the challenge from Parros. Later, Parros layed out an Oilers player and Stortini came in with gloves off after Parros. Stortini holds Parros in tight and it looks like Parros is trying to get free and apart from Stortini so they can fight but Stortini keeps the hug on a la Donald Brashear. They eventually go down to the ice. This one was a draw as not much happened. I don't know why Stortini drops the gloves and wants to go with Parros and then just hugs him the whole time. Protect your teammates and fight, don't hug. Maybe Stortini has new NHL syndrome? If you're a hockey fan then you have probably already seen it. Of course I'm talking about the dirty cheapshot by Chris Simon on Ryan Hollweg last night. Simon got hit into the boards by Hollweg and then when Simon got up and saw Hollweg skating near him he swung his stick with two hands at Hollweg up high which caught Hollweg in the mouth/facial area and Hollweg went down to the ice. We haven't seen something like that since the Marty McSorley-Donald Brashear incident I believe. I think Simon will be suspended for a long time for this. What do you think? Will the new NHL make Simon an example for future stuff like this? Since the NHL seems that they want all the rough stuff gone from the game they may suspend Simon for the rest of the season and maybe longer. View the YouTube video of the Simon cheapshot on Hollweg below. I haven't posted this fight on this blog so I thought I would now since there hasn't been much going on in the NHL lately. Back in October Derek Boogaard and Todd Fedoruk had a fight where Boogaard broke Fedoruk's face. Fedoruk needed to have surgery and I believe he had a metal plate put in somewhere. Anyways here's the video of this fight. Since there hasn't been many hockey fights recently, I went looking through YouTube, just browsing for any hockey fights I haven't seen before and I found some hockey fights with young players dropping the gloves. Some of these guys are in the NHL, some have had some NHL experience and some haven't made it yet. There hasn't been any hockey fights the past days but last night we finally got to see two. In the Kings-Blue Jackets game, Raitis Ivanans and Jody Shelley came out of the penalty box and dropped the gloves. Shelley started out quick throwing some rights. It was a good fight with Shelley landing more than Ivanans and I give Shelley the edge in this fight. View the video of the fight below. In the Lightning-Oilers game, Nick Tarnasky and Matt Greene dropped the gloves and had more of a wrestling match than anything else. Tarnasky went after Greene because he hit Eric Perrin. There were two hockey fights yesterday. The first was between Sharks' Mark Bell and Stars' Krys Barch. Barch got the edge as he threw most of the punches and Bell's jersey got over his head so he couldn't see much during the later parts of the fight. The other fight was a good one between Predators' Darcy Hordichuk and Ducks' George Parros. Hordichuk and Parros exchange lots of right hands. Parros looks like he landed a few and got the better of Hordichuk as Hordichuk lost his balance and went down to the ice. I give the decision to Parros in this fight. Usually Saturdays have a few fights because almost every team plays, but yesterday there was really one fight and the other one went so fast that the television cameras didn't even get it. The fight that was actually televised was between Lightnings' Ryan Craig and Panthers' Gregory Campbell. They had a short spirited bout with Campbell landing a what seemed to be big punch. I would give that one a draw though because it was all Craig at first in the fight. The fight that was missed by both television feeds was between Blue Jackets' Ole-Kristian Tollefsen and Coyotes' Keith Ballard. I have read that it was a quick fight with neither guy landing anything. This post will be a recap of Thursday's and Friday's hockey fights. On Thursday there were two fights. In the Avalanche-Blackhawks game Mark Rycroft and Danny Richmond dropped the gloves off a faceoff and had a spirited bout. They were mostly in tight and neither one could land a good punch. I would give this one a draw. The other fight was in the Coyotes-Canucks game with Josh Gratton and Jeff Cowan going at it. The television feed that I saw did not show the whole fight as when the camera finally got on the fight, Cowan was down and then Gratton lost his balance and went down to the ice while throwing one last punch at Cowan. I can't really give a decision because I didn't see the whole fight.